Naples has two faces: one that suffers, fidgets, breaks the laws, cries, struggles, despairs, tries to keep afloat, one that smiles, lives quiet life, has happy dreams and hopes and, very often, stretches its hand out to the other half of the city. To the second side, that of a cheerful and serene reality, belongs a large group of women who, on March 30, met at La Notizia for an afternoon-evening of culture, friendship and solidarity, enriched by the amazing touch of Enzo Coccia’s pizzas. Pizzaiole for a day, as the title of the rendezvous announced, leaving no room for doubts, saw the members of the International Inner Wheel, an organization run totally by women and with a dense network of clubs all around the world, putting their hands into the pizza dough under the supervision of the unequalled master pizzaiolo and tasting, after the afternoon training session, his pizzas. Led by the President Vittoria Giancaspro, the ladies from the Club Napoli Castel dell’Ovo joined the event, a perfect opportunity to greet the women month, with the aim to provide financial support to la Casa dei Cristallini in the Neapolitan Rione Sanità. Where Totò was born, one of the most problematic Neapolitan areas, favorite set of different films and a site that inspired Eduardo De Filippo for his pieces, there is the building, with its 200 square feet of space, recently renovated, which welcomes children and teenagers for workshops, recreational and extracurricular activities. Conceived by Father Antonio Loffredo, pastor of the Church Santa Maria Maddalena ai Cristallini, which decided, ten years ago, to make the parish house available to the community, nowadays, it is, for the young of that area, a safe place to play freely, study and go together. To reinforce the feeling of being at home felt within the walls of the ex-rectory and to keep on instilling it not only in those who frequent it, but in anyone who is in need, the members of the association founded by Margarette Golding worked hard to raise funds for it. 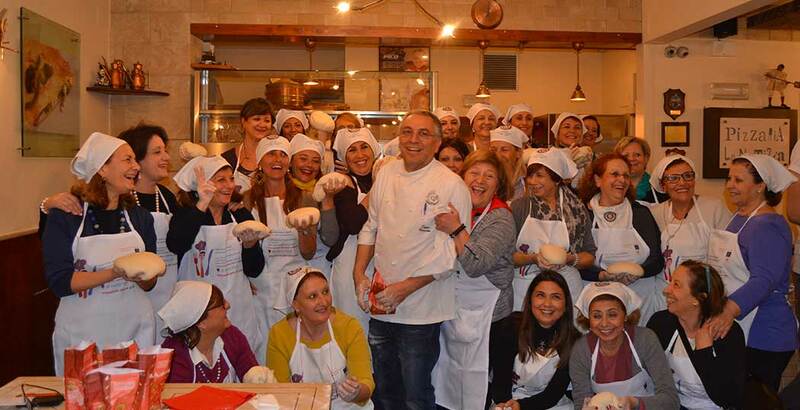 At dusk, the pizzeria welcomed also two inmates from the female prison of Pozzuoli, which, a short time ago, attended some training lessons with the Neapolitan master. As the Inner Wheel friends, these prisoners, for a couple of hours, took their uniform off to wear the pizzaiolo’s clothes. Such initiatives, in a district that is currently the subject of a wave of renewal and that, for its unparalleled artistic-historical heritage, is attracting the attention of hundreds of visitors from all over, let you think that things can change and you can start writing a new future.